The Bosch Freak is half wrench, half driver, all impact. The GDX18V-1600N 18V 1/4 In. and 1/2 In. 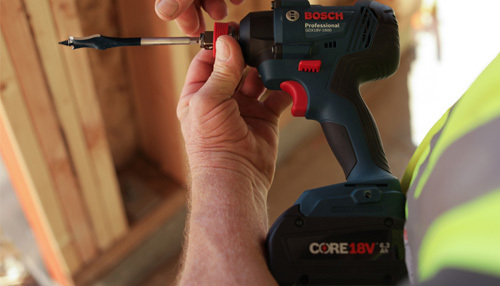 Two-in-One Bit/Socket Impact Driver delivers results, with the two-in-one chuck that offers a 1/4 In. quick-change hex shank with power groove for bits, and a 1/2 In. square drive for sockets. This innovative chuck provides versatility while eliminating broken socket adapters on a cordless drill. The impact wrench and driver’s efficient, powerful cordless motor produces up to 1,600 In.-Lbs. of torque, while the Bosch hammer-and-anvil system provide maximum impact endurance and up to 0-3,600 impacts per minute. The variable-speed trigger provides accurate driving speed. The driver has an LED light system to illuminate the work area. This is a bare tool; battery and charger are sold separately.